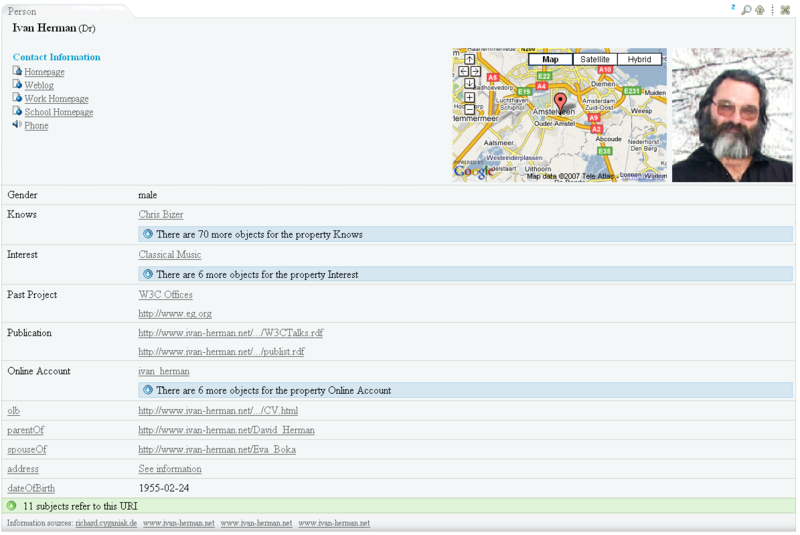 Zitgist is releasing a totally new semantic Web data viewer: the Zitgist DataViewer (on test servers). This new Web service pushes even further the semantic Web data visualization principles initiated with the Zitgist Browser. Changing the templating system to make them cope with a wider range of type entities even if these types are unknown by the system. In this blog post I will show you all the new features of the Zitgist DataViewer, how it can be used, and how each feature enhances the experience of users. On the semantic Web, everything is a �resource�. A resource can be seen as an Entity, or sometimes also called a Thing. This thing can be a person, an album, a place in the World, etc. Each entity is described by its properties: the age of a person, the name of an album, the population of a city, etc. The Zitgist DataViewer reads all the information available for these entities, and displays it to the user as best as it can so that users can easily read and understand information about these various entities. The first step performed by the Zitgist DataViewer is to get information about that entity and to create the Web page that will be presented to users. Figure 1 is the progress bar showing the status of the Web page creation process to the user. As you can see in Figure 2, each entity is represented in a table. 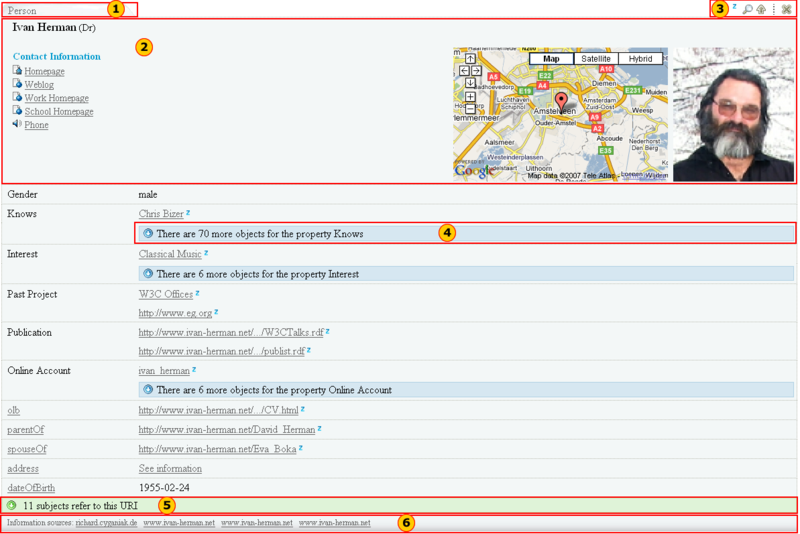 Within each table, information available about entities is displayed to users. Figure 2 represents information available about a person called Ivan Herman. Tab. This tab displays the type of the entity. In this case, Ivan is a Person. If the table is collapsed (see section about tools), the name of the entity will be displayed in the tab instead of the type. General information. This section displays general information about an entity. 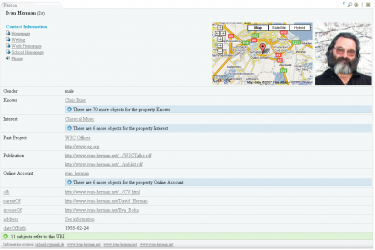 In this example, since the entity is a person, the name of that person, his contact information, his location and a photo of the person are displayed in the �general information section�. Tools. These tools are used to perform action on an entity table. See-more. This section aggregates all the same properties describing a person. 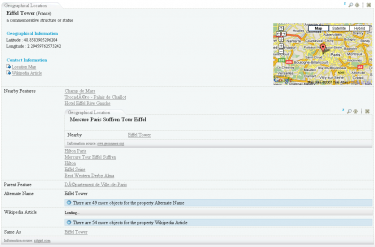 By clicking on the �see-more� button, the complete list of properties will be displayed to the user. This feature gives an additional means for users to manage information overload. References. This section lists all other entities referring to the viewed entity. For example, in this case the references are each entity that �knows� Ivan, such as friends, co-workers, etc. Information sources. This section displays clickable links to the locations of all Web sites that contributed the actual information displayed in the DataViewer. Note � depending on the specific type of Entity at hand � there are multiple display formats or �templates� (see below) that structure the content and format of the actual data presentation within the DataViewer. This section displays all general information about an entity. General information is typically the information a human would think best describes a particular type of entity. For example, typical information about a person would be name, contact information, location, birthdate, occupation, photo, etc. mini-Z icon. This displays information available from zLinks about the entity. Lookup icon. This shifts the focus of the DataViewer to this particular entity. 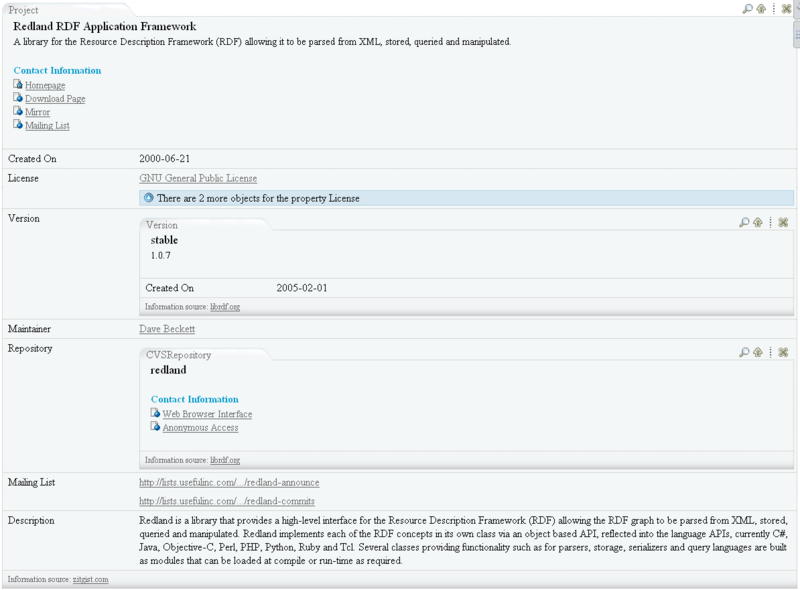 In some cases you may have more than one entity per URI, or you may want to focus your navigation on an embedded entity, and this tool allows you to only see the currently active entity. Up arrow icon. 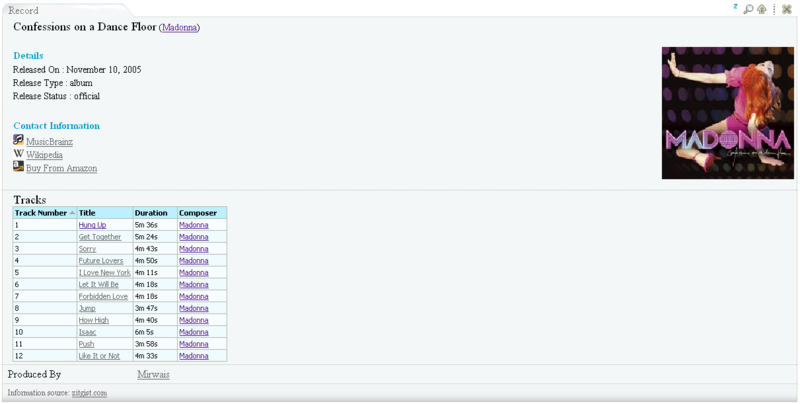 This scrolls the DataViewer up to the page from any entity table. Close icon. This collapses any entity table. By clicking on this icon, only the tab becomes apparent. This feature is used to aggregate and hide all same properties. 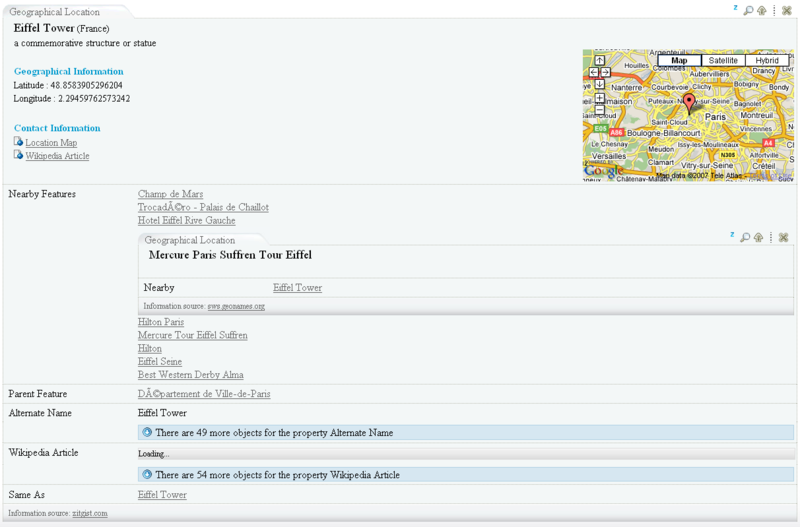 As shown in Figure 5, if the user clicks on the blue button that says that there are 70 more �Knows� properties, then all known properties will be displayed to the user. On the other hand, if the user check clicks on the �Hide objects� button, this expanded display is then collapsed with the section hidden again. With the Zitgist Dataviewer, users have the possibility to embed entities on-the-spot. This means that they don�t have to open a link in another page; they can do it by embedding it in the current page. If the user moves his mouse over a link within an entity table, he will see a blue right-arrow appearing. 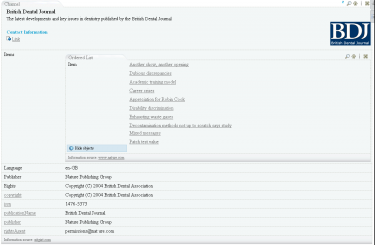 If the user clicks on the normal link (using the example of Uldis Bojars in Figure 6), then the entity Uldis Bojars will be opened in a new page. On the other hand, if the user clicks on the blue right-array, the Uldis Bojars entity will be embedded on-the-spot. If the user click on the arrow, a progress bar will shows the processing, by the server, of the creation of the Uldis Bojars entity. This action results in the entity Uldis Bojars being embedded in the current DataViewer page as shown in Figure 8. On the semantic Web, entities are more often then not referring to other entities. Such a situation arises when I describe the fact that I know another person. So, an entity (me) knows another entity (say, Bob). The references section of the Zitgist DataViewer thus shows the user what other entities refer to the current one being displayed. On the semantic Web, everybody can describe anything about everything. This means that I can describe things about a person entity, or an album entity, or about virtually anything. The only thing I have to do is to publish that information on the Web so that people can access it and do whatever they want with the information once published. 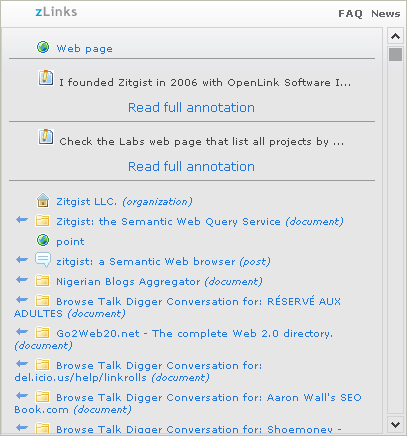 The information sources section of the Zitgist DataViewer is used to tell users where the information they are looking at comes from on the Web. So this section displays a link to all the Web pages where we got information about an entity that we display in the DataViewer. 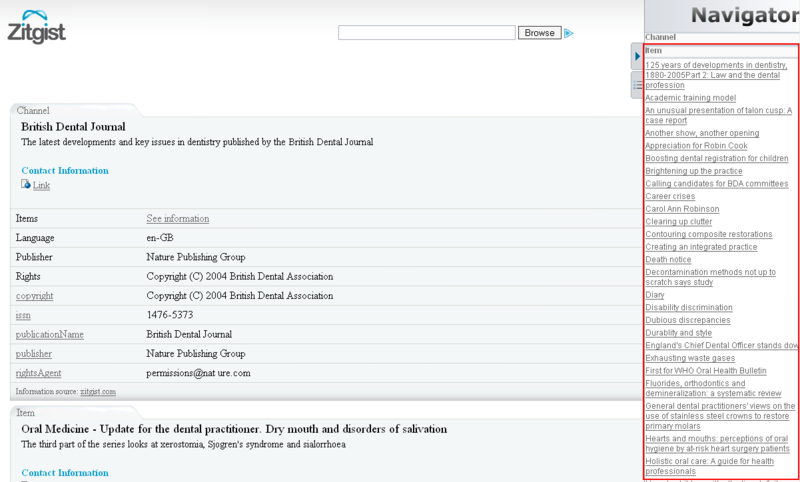 This way, users can check the provenance (so accuracy and trust) of the information they are viewing. In some cases, there may be more than one resource to display to the user for a given data source. If there are more than five resources to display, results are paged. This is another feature to help the user to manage the overflow of information. Since the pages are created asynchronously (using AJAX techniques), people also copy the link from their Web browser to send to others. To do so, the user simply clicks on the �link to this page� icon and then copies the URL. The user can click on the first tab to display the �Navigator Sidebar Tool� or on the second tab to display the �Selector Sidebar Tool�. Then he can re-click on these tabs to close and hide the sidebar. This tool (Figure 13) provides an overview of the entities available for a given data source. All entities are aggregated in the same section of the tool depending on their type (all persons together, all documents together, etc.). By clicking on one of these items the user is redirected to the table displaying information about the entity. This tool can be really useful with some scenarios. For example, if a user only wants specific information from a given data source; then he only has to click on the �Hide all� button to hide all properties and then to click on the property he wants to see. This way, only the desired information will be displayed. In essence, the Selector works as a filtering or faceting mechanism. The Zitgist DataViewer uses a templating system to organize the data available for a given entity. Depending on the type of an entity (is it a person? a music album? a document? a geographical place? etc.) the viewer will manage and organize the information available for an entity differently. Each template tries to organize the information such that it is optimized for human reading and understanding. By example, each template defines which information to put in the General Information section of each entity. It determines how to format and organize that information, how to handle specific things such as images, how to insert certain widgets such as maps and grids, and how to optimize the presentation of other kinds of information. The only goal of the templates is to make information for each viewed entity more readable, so understandable, by humans. 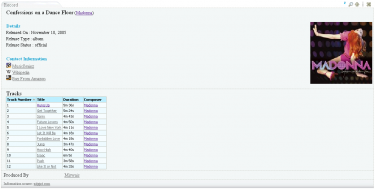 The DataViewer�s new templating system also manages some properties even if a template is not defined, resulting in a hierarchy of templates composed of sub-templates inherited from upper templates. This means that even if the Zitgist DataViewer doesn�t know how to organize information of a certain type of entity (because the viewer may not have a template for that type), it can organize other parts of the information based on existing templates and the behaviors of certain special properties. 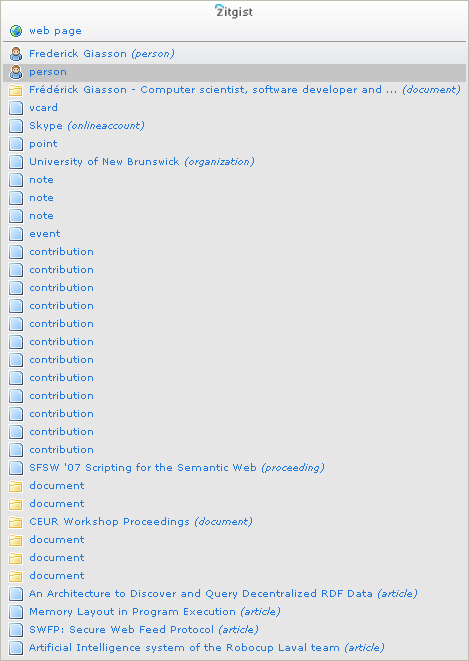 Other Ontologies also result in the addition of still more templates, for example: wgs84:Point, wps84:SpatialThing, bibo:Document, rss:Channel, rss:Image, rss:Item, frbr:Endeavour, frbr:Manifestation, rdf:Bag, rdf:Seq, owl:Thing. While the templates organize the structure and scope of information about entities, skins manage the appearance of that organized information. The Skinning System for the DataViewer governs which colors to use, which images to use, which dimensions to use, where to place on the screen, and what to show. There are currently two skins created for the Zitgist DataViewer. 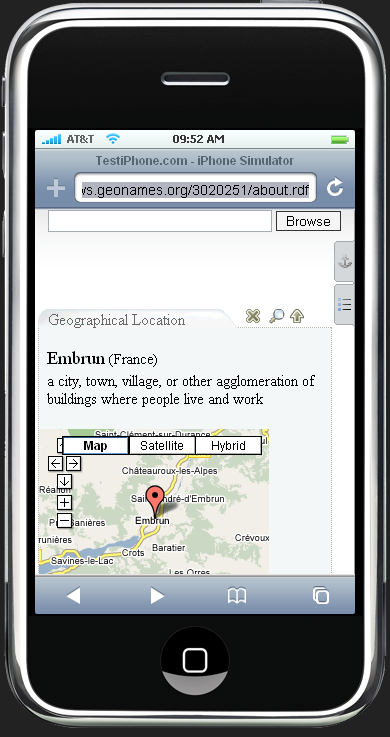 The default skin is the standard appearance of the DataViewer within your Web browser. The second skin � called the mini-Dataviewer � is used to optimize the display of the DataViewer within a restricted area, such as a small container on a Web page or a mobile device such as the iPhone. Figures 15 and 16 show two entities viewed with this mini-DataViewer interface on an iPhone. As you can see, the information is not displayed the same way, and the user interface and colors have changed to optimize for a small mobile device. The zLinks Web service has now been integrated within the Zitgist DataViewer. Users now have access to related stuff about every linked entity displayed in the DataViewer. These zLinks provide not only related information about an entity, but also what that entity is about and what also refers to it. 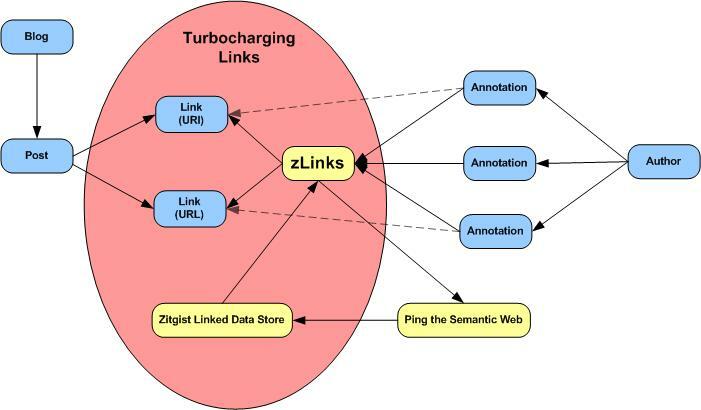 In the Figure 17 we use the zLinks Web service to take a look at the publications (in this example, the talks) linked from the entity Ivan Herman. The service lists all talks by Ivan, as well as provides links to his personal profiles and to the profiles of his friends. There are a couple of visualization of URIs using the Zitgist DataViewer. 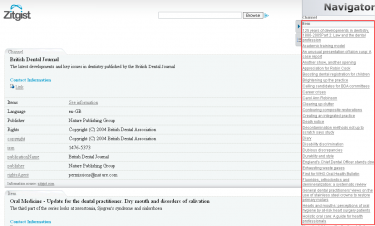 The Zitgist DataViewer is the next step to make semantic Web data more accessible and usable. It is an important upgrade over its earlier version, what had been known as the Zitgist Browser. We are now learning how to move beyond the �triple� and how to better visualize semantic Web (RDF) information published on the Web. Many new features in the DataViewer help users to manage information overload. Others provide feedback or access to still further useful information. Performance and display speeds have been improved. Organization and a templating system add further flexibility. We believe the usability of the DataViewer has been greatly enhanced. Still, we are not satisfied. We welcome your feedback and will continue to seek improvements for the next round of enhancements. 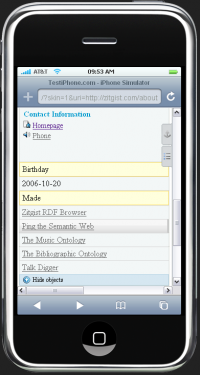 Zitgist is committed to data usability and ease of access. We welcome your participation as we continue on this quest! Every link has a relation on the Semantic Web. Each time a person create a link from a web page to another web page, it does much more than simply linking… In fact, the Web and the Semantic Web are starting to mesh together. The meshing is occurring at the level of the URI, or more specifically at the level of the URL if we are talking about the Web. This is what I will show you in this post using a WordPress plug-in I developed using Zitgist technologies. The first objective of this project is to try to find out how people could integrate semantic web concepts and principles in the systems they daily use. How can we integrate the semantic web into Blogs for example? Is the use of semantic web technologies only good at publishing content in RDF? This is certainly one thing, but I doubt it is the only one. This is for that reason why I put some time in developing this prototype. The second motivation is to create a good prototype of a system using Zitgist’s architecture to show people how they can take advantage of Zitgist to develop their projects; to make their vision a reality. On the Web, people mainly manipulate web page resources. They locate them on the Web using a unique locator, called a URL. On the semantic web on the other hand, people do not only manipulate documents; they manipulate many kind of Things, many kind of resources. They refer to them using URIs. The difference between a URI and a URL is that a URL is resolvable on the Web, but not necessarily a URI (in fact, a URI is the super-class of a URL). However, best practices suggest people to make URI resolvable (dereferencable) on the Web; in such a case a URI is a URL. Anyway, all this to say that a URI in the semantic web can be a URL on the Web. There are many use cases emerging from that special digital environment. As an example, many people will use a Wikipedia Wiki Page URL as an URI for a topic, an interest, or for many other relations to these concepts. In such a case, the URL of a webpage is used to refer as a Concept. I don’t want to discuss about the basis of this, but it is a fact, and we have to handle it. This plug-in is quite simple in appearance, but has some really interesting results for users. The only thing this plug-in does, is to show blog readers existing related data for a given URL and, in some case, to enable them to perform actions based on this data. By example, if I make a link to Tim Berners-Lee‘s web page, a user could be interesting in having more information about Tim, directly from the article he is reading. Tim has many data related to him from the semantic web. That is it. The plug-in display related information to links from a blog post. In this case, it is people Tim knows and Tim’s profile. The information is shown the users using a contextual menu. The data is requested to Zitgist’s systems and is displayed to the user. This is that simple, but how powerful? The plug-in is quite useful in many ways. In fact, it instantly displays related information about a link to readers of the blog. From any blog post, a reader can easily jump to resources related to each link. Above I said that a URL, a web link, could be much more than it usually appears. So bellow, I show a couple of use cases showing the potential behind the idea. Here a user can check the webpage directly, or he can jump to related resources. These related resources come from the semantic web. The first one is the description of the project. The following two are the authors of the ontology. The last resources are documents related to the ontology and the “version” of the ontology. For the non-initiated readers, I would suggest you to read this best practice tutorial explaining how to publish semantic web data on the web. Sometimes (okay, not that much at the moment, but I hope people will start), people link to resource URIs (so, URL that can be dereferenced to get RDF data about the resource, or its web page representation if available). The result is that readers have directly access to my profile, articles I wrote, etc. From the blog post, the reader can automatically buy the related resource on Amazon. This is only one possible action, but many others are possible; the only limit is imagination. The simple links you create from your blog posts to other web pages have much more related information than you can think. 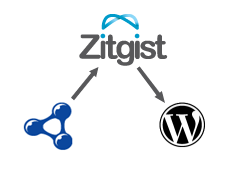 Using this prototype Zitgist WordPress plug-in will explicit these links for your reader. You only have to read some of my other blog posts to try it by yourself. Some results are quite impressing. I will make this plug-in available for download sometime next week. This idea has been promoted by Kingsley Idehen for some time now. He uses to call this idea enhanced anchors, or, a++. The idea is simple: enhancing anchors to explicit links to a certain resource (URI or URL), and optionally to perform some action on them. This prototype is a first try in that direction. Many upgrades should follow so we really unveil the power of this new kind of linking; of this new way to relate things together, and to explicit these relations. Please report me any bug, issues, cross-browsers problems, comments, suggestions, etc. It is not because we had some issues with the Zitgist Browser‘s server that things stopped at Zitgist. In fact, many projects evolved at the same time and I outline some of these evolutions bellow. A new version of the browser is already on the way. In fact, the pre-release version of the browser was a use case; a prototype. Now that we know that it works and that we faced most of the issues that have to be taken into account to develop such a service, we hired Christopher Stewart to work on the next version of the browser. He is already well into the problem now, so you could expect a release of this new version sooner than you could be expecting. At first, there won’t be many modifications at the user interface level, however, many things will be introduced in this new version that will help us to push the service at another level in the future. 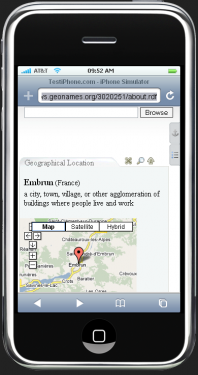 The version 3.0 of the PingtheSemanticWeb.com web service should be put online next week. It will be a totally new version of the service. It won’t use MySQL anymore; Virtuoso has replaced it. The service will now fully validate RDF files before including them in the index. More stats will be available too. It is much faster (as long as remote servers are fast too) and I estimate that this only server could handle between 5 to 10 million pings per day (enough for the next year’s expansion). This said, the service will be pushed at another level and be ready for more serious traffic. After its release, a daily dump of all links will be produced as well. The Bibliographic Ontology Specification Group is on fire. We are now 55 members and generated 264 posts in July only. Many things are going on here and the ontology is well underway. We should expect to release a first draft of the ontology sometime in August. If you are interested in bibliographic things, I think it’s a good place to be. Finally, Zitgist’s Semantic Web Query Service should be available for alpha subscribed users sometime in September. You can register to get your account here. Also, take a look at what I wrote about vis-�-vis this search module (many things evolved since, but it’s a good introduction to the service). So, many things are going on at Zitgist and many exiting things should happen this autumn, so stay tuned! Five weeks ago I introduced the Zitgist Browser on this blog. At that time, I talked about a pre-release of the service. These two little words probably helped to explain what followed in the following weeks. In fact, some of you probably noticed that the Zitgist Browser was down half of the time for a couple of weeks. In fact, we found many issues at many levels that rendered the browser�s server unstable. In the last weeks, we performed a battery of tests to fix all issues that appeared. Now, about three weeks later, the server is back stable. At least, it has been online for the last couple of days without any issues. Thanks to the OpenLink Software Inc. development team, we have been able to stabilize the service; and it wouldn�t have been possible without their help and expertise. Finally, stay tuned for the next release of this service and continue to use it and report issues that you could encounter while browsing the semantic web (more information about the next version in the next blog post); and sorry about the possible frustrations you possibly had when you used the unstable version of the service.